CTW Removals Ltd - Removals/Storage, Rubbish/Waste/Clearance based in Ash Vale, Surrey. Invoice history based on 359 reviews. 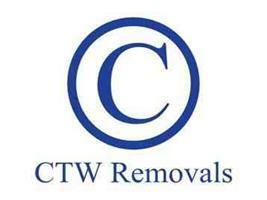 CTW Removals, headed up by Alan Wells, is a family-run business specialising in small property moves (1-3 bedrooms). We have a wealth of experience in the service industry and have learnt that a professional and reliable service doesn't need to be dull and boring. We are proud of the reputation that we have built and we enjoy a healthy level of repeat business and recommendations. We are strongly focused on providing a high-quality removal service and man and van service in Guildford, Godalming, Aldershot, Ash Vale, Ash, Farnham, Farnborough, Frimley, Camberley, Fleet and throughout the UK. We strive to achieve unrivalled customer satisfaction - we will do everything we can to meet and exceed your expectations. Our clients include; The NHS, Citizens Advice Bureau, Accent Peerless, Lok'n Store, Radian, Patient Connect Ltd, St James's Place Wealth Management, Bridges Estate Agents, The Revival Company and Farnham Assist to name just a few. Whether you require our two-man and van service for a local move or a team of removal staff and multiple vans to move you across the country, we are here to make your experience as easy and stress-free as possible. We are a small family-run removals company based in Ash Vale. We carry out moves throughout the UK.